Our accommodation product range is basically meant to facilitate all our clients specific accommodation needs. Hotel facilities – to accommodate short and medium long stay;. Home and villa rental – to accommodate medium long to semi-permanent stay. As for our Hotel facilities: we choose Batam’s best hotel accommodations that really offer good value for money. In the joint cooperation with these hotel facilities Courtesy Agents managed to negotiate affordable rates that are available by booking through our website only. To complete your “stay package” we offer free transportation to these hotel facilities upon your check-in/out to your point of arrival/departure in Batam. As for the Home and villa rental options: we choose Batam’s better, well known and safe housing developments. These developments and the different home and villa options available, offer you the possibilities of work and important amenities close in distance reach or within reasonable distance available. 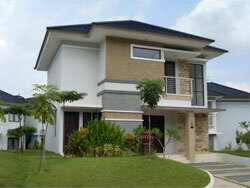 All selected housing estate’s offer several home and villa rental options. With regard to the rental options we like to highlight that Courtesy Agents is not engaged or related in any way with parties that offer the rental option(s). We choose to ensure that our client finds the comfort to make “his choice” on any option he/she is really comfortable with. • Issuing or support by verification of your contractual engagement with your landlord. This package deal comes with full transportation support and full service guidance. Let our team support and assist you to find your most enjoyable stay in Batam !